Although nests are central to colonial life in social insects, nests are sometimes damaged by predators or natural disasters. After nest destruction, individuals usually construct new nests. 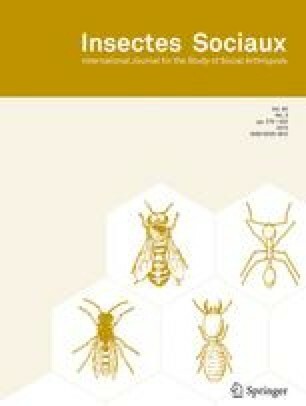 In this case, a sophisticated mechanism like the scent trail pheromone used in large insect colonies that recruit individuals to new nest sites would be important for the maintenance of eusociality. In independent-founding Polistes wasps, it is well known that queens enforce workers physiologically on the natal nests even if evidence of trail pheromone use has not been exhibited. We investigated the effect of the queen on an alternative strategy for the maintenance of eusociality by first females after nest destruction in the primitively eusocial wasp Polistes chinensis. We predicted that the first females in queen-absent colonies have various behavioral options after nest destruction. Even if the females construct new nests cooperatively with other individuals, the new nest construction should be conducted more smoothly in queen-present colonies because the queens regulate the behavior of wasps. We made wasps construct new nests by removing the entire brood from existing nests. The presence of the queen did not cause variation in the alternative strategy of the first females, as the first females (workers) usually constructed new nests cooperatively irrespective of the queen-presence. Thus, the workers in the queenpresent colonies affiliated to the new nest construction more smoothly and constructed new nests more efficiently than workers in the queen-absent colonies. Our results suggest that the presence of the queen is important for maintaining eusociality in primitively eusocial wasps after nest destruction. Received 8 February 2005; revised 5 October 2005; accepted 17 October 2005.